What do we know about the early life on earth - before we humans came, before we started recording our observations for posterity? There was a time when we thought we were the beginning of all things important. But, now we have enough research to show a rich and diverse world that thrived without us, that predates our existence. How far back did the first life on earth begin? What was this life form? How did it get there? And how did we evolve from these seemingly bizarre creatures that have nothing to do with the level of sophistication and predominance we command today? The first step towards understanding these ideas is to get acquainted with the geological timeline as agreed by archaeologists and geologists and paleontologists. Once we get familiar with the various eras, time periods, and epochs from Precambrian to Holocene, we begin to get the larger picture of how and why the various life forms came and went over time. Paleontologists are still discovering bits and pieces of the jigsaw puzzle, and we have enough information to piece together an overall slightly-blurry picture, but, not enough to get a definitive crystal clear unequivocal picture of what happened on earth before humans started meticulously leaving records of their existence. The book. Comprehensive. Filled with pictures. Short, crisp information. Much-loved at home. A perfect reference book. Index makes it easy to look up. Shows not just animals but plant life as well and other early forms. Starting at about 3.8 billion years ago, we learn about the earliest-known form of life on Earth, a bacteria that still exists today, and we continue through mind-boggling millennia during which this-can't-be-possible type of life forms evolved, and we also learn about the massive extinctions that wiped out entire species, lost to us forever. Not a book to read through in one sitting, this coffee-table-style book is filled with pictures and snippets that are best enjoyed in small doses. Take any fun non-fiction topic for learning that kids might be interested in, and there sure is bound to be a book by Steve Jenkins, filled with succinct kid-friendly information and gorgeous cut-paper collage illustrations. As the title says, prehistoric creatures are shown in actual size. So, a double-page spread showing the face of an eight-foot terror bird indicates that is its actual size. A foot long double-page spread of a partial millipede lets us extrapolate and gauge its 6 feet long body. Each spread has a short fact about the animals, plus how long ago it lived and what its vital statistics are. Back of the book has further details about each animals, along with an introductory note discussing How do we know what prehistoric animals looked like. 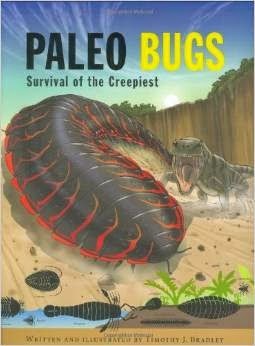 As the subtitle states, some of the creepiest inhabitants of early Earth are showcased in this book. Each page shows one creature with its name, how long ago it lived and some information about its possible lifestyle in its time. Among the Sanctacaris, Meganeura, Calymene and suchlike, the kid zoomed in on a handful that impressed him, one of which is Pterygotus, a ferocious 9-foot long "sea scorpion". Possibly because Walking with... series showed their amazing adaptations. The prolific Ms.Arnold has written countless non-fiction picture books about animals. This book walks us through some of the ocean dwellers in prehistoric waters. 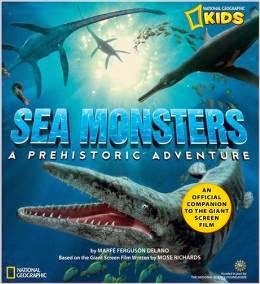 Starting with early sea reptiles like Nothosaurs (kid's favorite) to fish-like Ichthyosaurs to gigantic long-necked Plesiosaurs and the top predator, the Mosasaurs, the book is packed with child-friendly information. The focus is on the Mesozoic aquatic reptiles, sharing whatever information is agreed-upon at the time of writing the book. While one creature's diet and reproduction is known, another's size and predatory habits are known. Our favorite section was about Mary Anning, the fossil-finder. 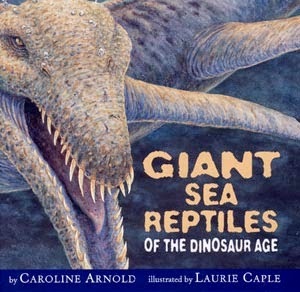 A companion book to National Geographic's film of the same name, the book fascinated the kid who is partial to prehistoric sea monsters much more than land animals. Enchodus, Styxosaurus, Caproberyx... we learn about a lot of the fantastic creatures of the time. The photo-like pictures are amazing. The story starts by saying how Kansas, so far away from any body of water, came to have fossils of the prehistoric ocean creatures. We are introduced to "Dolly" (Dolichorynchops osborni) and the book follows along her story and ends with how millions of years later when the sea is gone and the land is part of the vast plains of Kansas, paleontologists will find our Dolly and figure out her story. Megalodon has held a certain fascination for the kid for a while and this book showcases its ferocity and its world. 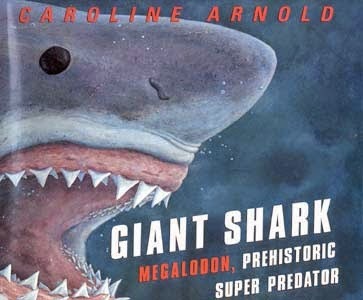 Full of information - from its replaceable teeth and its babies, to theories about why the Megalodon disappeared, the book was a good read for all of us. The only thing that bothered him about the book - at least the edition we borrowed from our library - is that on page 8, where we learn about ancient and modern sharks with a timeline showing when Megalodon lived, the text says "Invertebrates (animals without bones)". Is it animals without bones or animals without back bones? Another informative book by the same team, which shows the prehistoric skies criss-crossed by the flying giants. Pterosaur fossils have been found in all continents and paleontologists are still trying to learn all they can about these magnificent avian creatures that went extinct with their terrestrial kin at the end of Mesozoic era. As a result, the drawback of any such book is that the information is only current up to the time of publication. Naming schemes change, new fossil evidence uncovers or invalidates earlier conclusions. 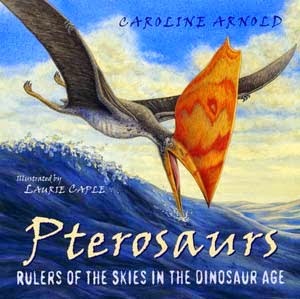 However, this exceptional 40-page book takes us back to the times when Pterosaurs ruled the skies. The illustrations don't just show the details of each of the nearly two dozen creatures, but also lets us peek at what the world might have looked like at that time. Although organized as a chapter book, this picture book with its large font and brilliant illustrations has a flowing narration that makes it an absorbing read. We learn about distinguishing features of each pterosaur, as well as its possible dietary preferences and behavior. Prehistoric sea creatures being the top favorite, Dorudon easily became a household name right along with Basilosaurus and Mosasaur and Pleisiosaur. And, while digging deeper into Dorudon, we learnt about Ambulocetus ("ambulo" = walking, "cetus" = whale"); and came upon rhodocetus. 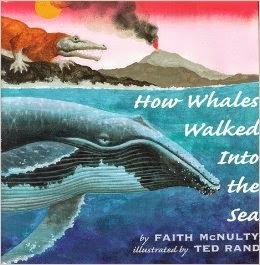 While searching for picture books on the topic, I came upon this absolutely wonderful book that combines scientific discoveries and facts with the story of how a four-legged mammalian creature eventually turned into a purely aquatic whale as we now know it. Why was this so fascinating? Well, most cases we've encountered till then indicated that life originated in the oceans and finally walked out of the water to occupy the land. Whereas, this particular case shows that a land mammal walked into the ocean. The author describes the adaptations in physique and diet for each of these stages in evolution that possibly resulted in the creature we know as whale now. As with such books, the information is only current at the time of writing. Since its publication, through DNA studies, in addition to fossils, scientists believe the oldest known ancestor is not Mesonychid (as in this book), but is Anthracotheriidae. This is a one-of-a-kind book, as it traces the incremental changes of just one species (whales as we now know them) while providing scientific discoveries/studies/evidence that led to this conclusion. Dinosaurs have fascinated one and all, and have been the poster-child for the prehistoric drama of life - their heft, their variety, their unchallenged reign, and their sudden extinction all adding to their enigma; and the small mammals that hid from the thundering lizards remained obscure. 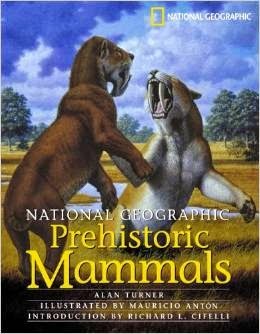 This book showcases not just the well-known mammalian stars of the time, like Smilodon (sabre-toothed cat) and Mammoths (woolly, pygmy, imperial, Columbian, Jeffersonian...), but also the massive rhino-like Indricotherium and elephantine sloth Megatherium among other megafauna. The pictures are carefully constructed from available fossil evidence - these well-researched artist's rendition has to suffice for now as we have not enough evidence to state much about their looks and behavior for certain. The text does seem to suggest a lot of speculation, and the information is mostly superficial, but enough to get us interested in learning more about our mammalian roots. 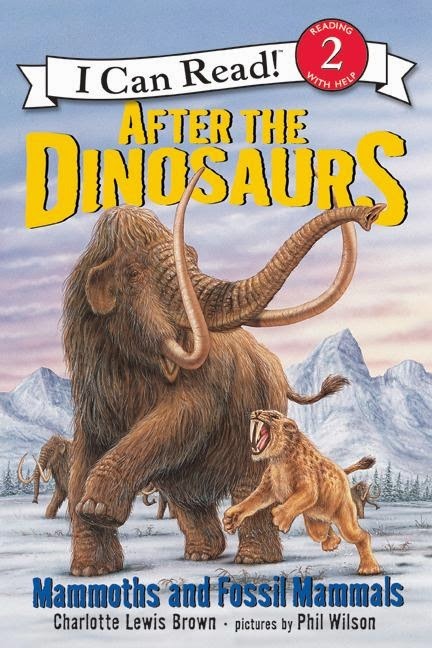 Perfect for Kindergarten through Lower Elementary Prehistory fans, this book introduces a variety of mammals and mammoths after the dinosaurs went extinct. The pronunciation guide is handy and the information is presented in a child-relatable way. The detailed watercolor illustrations with each spread devoted to one animal makes it easy to flip through the pages and land on a particularly interesting one and read without feeling overwhelmed. Two of my favorite writers in the picture book world, not that they know me or anything, were teamed up to make this brilliant book. the north was mostly ice and snow. these beasts had comfy coats of hair. 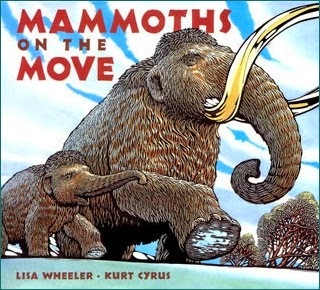 Thus starts this book with upbeat rhythm and catchy refrain that tell the story of these herds of woolly mammoths that traveled to warmer pastures over winter braving predators and slippery ice; only to reach there and turn back and do the trek all over again. Crafted with wit and wordplay, the book is a pleasure to read aloud, foot-tapping optional. The illustrations are stunning, with snow and cold creeping from page to page, putting us right in the ice age, leaving us reaching for our woolly sweaters. Much like Mr.Cyrus did while creating these pictures, as the back flyleaf informs us. Captured from various angles, especially low ones, the mammoths tower over us on the pages as they trek purposefully along, while also holding some comic postures with their trunks held high as they cross deep icy waters; their protective circle during a smilodon encounter and their jaunty motion are all rendered brilliantly to a story within a story, that Mr.Cyrus is well-known for. 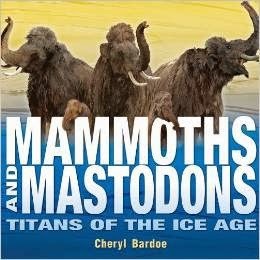 Relating the true story of how a well-preserved baby woolly mammoth was found by two Nenet brothers, Kosti and Edik, of northern Siberia, in 2007, the book intersperses the scientific process of studying the animal using modern technology with facts and relevant information as we learn more. Baby Lyuba, the baby woolly mammoth, who died about 40,000 years ago, finally put an end to speculation and allowed us to know about these lumbering giants of the ice age. And, learning about them could help us keep our elephants from going extinct. Colorful charts, diagrams, Proboscidean family tree, illustrations, and photographs, along with information boxes and glossary makes this an engaging read for the Upper Elementary kids. Good Lord Sheela! 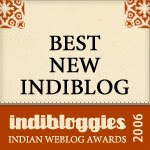 What an incredibly fantastic list, picked as usual with much thought and research! Can't get any better. Seems like you've read every single picture book that's out on the pre-historic theme. A joy just browsing it! Thanks Sheels for giving such a comprehensive list this CROCUS. Sheela- Just for these kinds of things you do with such clarity and ease, I want to be adopted by you... wonderful reckoner. What a massive list of books.. I'm with Art here - would love to be adopted by you! Great set of books, Sheela.